Does it really matter how you choose to lace your dress shoes? Or what type of laces you should use? What is the difference? Yes, it does. Men’s style experts agree – bar, or straight, lacing, is more formal, and the only way to lace dress shoes. Criss-cross lacing is too casual, and not appropriate for formal events. Walk down the aisle, looking dashing, and be in classic tip-top shape for that formal business meeting. Impress your lady, with a pair of well laced, dress shoes. Yes, she will notice the difference. Are all your ‘good shoes’ dress shoes? No, they are not. There are many styles of men’s shoes, and they are not all ‘ dress’ – there are loafers, brogues, Oxfords, wingtip brogues, chukkas, Derbies, boots, Monk straps, and more. Different types of shoes have laces that are specifically engineered for that particular shoe. Laces are designed to complement the style, and function of the shoe. Laces for athletic shoes are very different to laces for formal shoes. What kind of laces do you need for dress shoes? Dress shoe laces are made from different materials and are designed to fit through the eyelets, or holes, in the ‘vamp’ part of the shoe. These are the two pieces that open, to allow you to slip on your shoe more easily when the laces are open. Ill-fitting laces will make it more difficult to lace up, and open, your shoes. Make sure the length is correct. There are two main styles of a dress shoe laces. They can be either a thin, round, shaped lace or thin and flat lace. Both types have a waxed edge. Laces can be made from either organic fibers or synthetic. What is the difference? Well, synthetic laces are very strong, but, tend to come undone more easily. Why Do They Come Undone All The Time? Which Laces Should You Choose? Even if you have bought brand new formal shoes, you need to check the quality of the laces. Cheaply made laces can snap, and it is worth your while to upgrade to a better quality lace. Dress shoelaces are a ‘finer’ styled shoe-lace than regular shoelaces. Never buy nylon athletic laces, but, rather buy the best dress laces you can afford. You could choose cotton laces, or a poly blend/nylon lace. Remember that they must be either thin and round, or thin and flat. There are two factors to consider, that will help you decide what length lace you will need. The first is the number of ‘eyelet pairs’, or ‘holes’ on your shoe. The second being the width and size of your foot. Why does this matter? Well, over time, your shoe may stretch a little, or your feet may be a bit bigger. Generally, you will only ever be deciding between two lengths, of laces. Dress shoes either have an even, or odd number, of eyelet pairs, and you choose laces accordingly. Men’s fashion stylists suggest that you check the laces that come with your shoes. 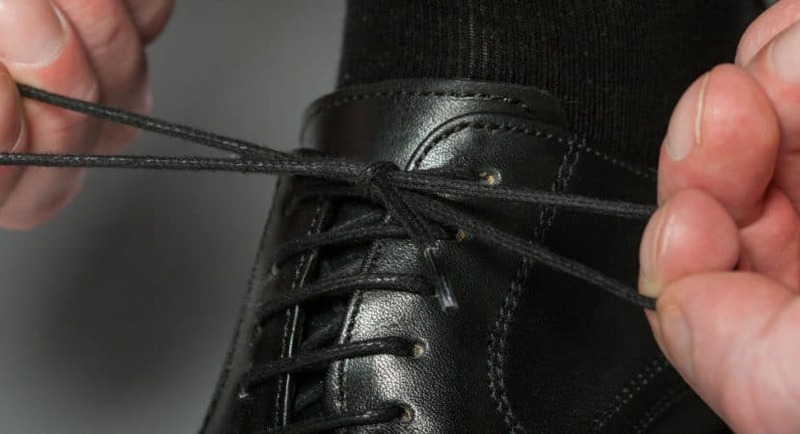 Remember that even some higher quality dress shoes may be sold with inferior quality laces. Your shoes are an investment, and upgrading to better quality laces is recommended. Men’s fashion has also seen, historically, some very interesting trends with laces. There have been satin ribbon laces, velvet ribbon laces, and wider laces. Men then tied small bows, which matched their bow ties, on their shoes, and looked very dapper. Trends change and, even if you fancy some vintage laces, you may have a problem fitting them into modern shoes, as the eyelets may be too small. Dress shoes are best paired with a classic pair of dress laces. Count First! Odd or Even? You need to count the number of pairs – they will be odd or even. This is important. You must not start threading your lace straight away. If your shoe has an uneven number of eyelets, the threading process will not even out, and one side will be shorter and irritate you – forever. What you will need to do is to make sure that one end stays a few inches longer, 2 or three. Bar lacing looks smarter, and the laces are over the eyelets, not under. Feed the laces in, through the holes, and then, like a big loop stitch, take one lace over to the opposite. Repeat with the right, and left laces. Do not cross the laces over. The same lace will thread over the same level eyelet pair, and create a straight line. This is bar lacing and compliments your dress shoes. Dress Shoes And Colored Laces? What are the Style Rules? Traditionally men’s dress shoes are worn to smart events or may be part of formal business attire. ‘Fancy colored’ laces are also available but proceed with extreme caution. Your enthusiastically chosen bright colored shoe laces may scream poor taste, when worn with beautiful Oxfords, to a business meeting. However, they can add a lot of character, and be a fun choice if you’re wearing formal dress shoes to a less formal event. The golden rule, often quoted, for men’s shoe choices is this – “Avoid brown in town.’’ Generally, brown shoes, even dress shoes, are not a good choice for the evening. It is better to wear black dress shoes in the evening when you are ‘on the town.’ Be sure to make sure your laces are threaded correctly in your shoes, and never – never – criss-cross your dress shoe laces. It may seem like a small difference, but it looks much smarter. Keep your dress shoe laces straight, or bar, and enjoy looking your stylish best. How Long Do Dress Shoes Last?